I know we are in the middle of January, but I just saw this idea on a website called The Honest Company (www.honest.com) and I wanted to share it right away. Hopefully, this idea is new for you too! Here’s the basic idea: At the beginning of a new year, start writing down blessings that happen to you throughout the year and put them in a container. 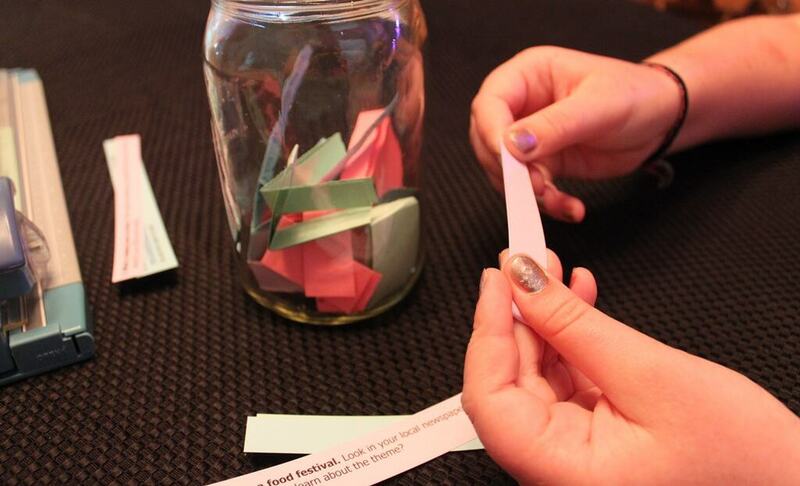 On New Year’s Eve or Day 2014, you can empty out the jar and read all about the year of blessings that you had! The Honest Company’s blog suggested writing down wishes or memories made throughout the year but I thought writing down blessings whenever you think of them instead of memories and wishes would be a positive way and perhaps a reinforcing way to look for the good things that happen to you as you heal. Rebuilding your life and trying to find a new way to live your life after the loss of a loved one is a slow process that has many stops and starts. I have found that it sometimes is a subtle process too. Everyone’s journey is unique. Small changes can be happening to you and you may not be aware of it. What kinds of things am I talking about? For me, my sleep pattern started changing as I began to gather strength after my husband’s death. Instead of tossing and turning or hardly sleeping at all, slowly I began to be able to fall asleep and stay asleep for longer periods of time. Blessings happen to us every day and we may take them for granted. The sun is shining, someone smiled at you, your jeans fit. A blessing can be whatever you think is a positive thing that has happened to you! I try to tell myself that no matter how bad the day was, there had to be something good in it. You know what those days are like. Those days when everything seems to go wrong or it doesn’t happen the way you planned? I still try to find a positive in all that frustrating stuff. Sometimes it’s just a blessing that the day is over and you can wake up fresh and try again the next day. I know life can be painful but if I can’t change the circumstances then I have to try and learn to roll with it and find some good somewhere. Have fun with this blessings idea. It doesn’t have to be an every day thing. You can write down whatever you want whenever you want to write it down. But at the end of the year it might surprise you to look back on the blessings that took place in your life in 2013. Last night I found a container for my blessings and I wrote down two: a wonderful son and good health.